With the open water season over for the year, I've been thinking about some swims that I want to do next year. My latest idea is a swim in the Great Salt Lake. I have been doing a little research into swimming in the lake and am curious to hear if anyone has done any swimming there. It seems like such an obvious place to swim, but I think many people are scared away by the shallow waters, salt, brine shrimp and the famous lake stench. I have heard that the lake is pretty shallow and I was able to confirm that fact on Utah.com. The deepest point is only 33 feet and the average depth is only 20 feet. One challenge in doing any kind of distance swim in the Great Salt Lake will be making sure that the water is deep enough. 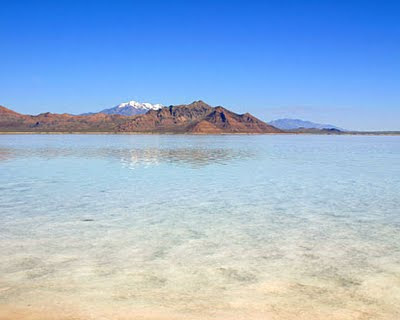 The Great Salt Lake is very salty with an average salinity of 5% to 27%. By comparison, the average salinity of the ocean is 3.5%. My biggest concern here is getting salt water in my goggles. I talked to someone once who told me there used to be swimming races in the Great Salt Lake and that the salt was really a nuisance, especially with goggles. I will be sure to have a support boat near me and will plan on packing a few extra pairs of goggles just in case. I'm also a little worried about getting salt water in my mouth. I recently did a swim from Alcatraz Island to San Francisco, and the taste of the salt water in my mouth was the one thing that made it less enjoyable. Having grown up in Davis County, I have smelled the distinct smell of the Great Salt Lake on many occasions. From what I have read, the smell is due to decaying algae that washes up on the shores. When you are out on the waters, supposedly the smell doesn't exist. From the websites I have been reading, it looks like there is swimming at both Antelope Island State Park and at the Great Salt Lake Marina. Antelope Island also has showers, but I wasn't able to find out if there are showers at the marina. I'm thinking about trying an island to island swim. 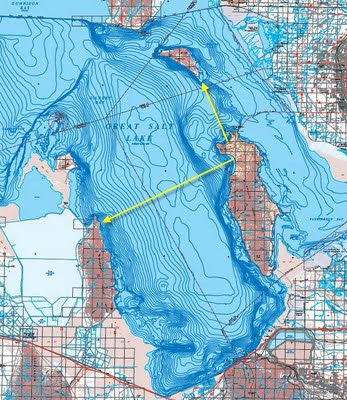 One option would be from the Antelope Island Marina swimming northwesterly to Fremont Island. This swim would be about 5 miles. Another option would be to go for a longer swim from Antelope Island southwesterly to Stansbury Island. This swim would end up being 10+ miles. If you have any experience swimming long distances (or short distances) in the Great Salt Lake, or are interested in trying it out next year, please leave me a comment. Definitely count me in on the swim with you. We can use my two-man kayak as the support boat if you want. How about doing both swims. The Fremont Island swim sometime in May/June and the Stansbury swim sometime July/August? I thought that if anyone else would be interested in doing this it would be you. Yeah, I'm up for doing both of them. We'll need to figure out the best start and stop locations. I don't know if we would need to have someone drop us off at the start with the support boat and then drive to the end to pick us up or what.